“What hotel? What hotel?” demanded these hawkers. We thought they were taxi expediters – so we gave our hotel name, Melia, and were conducted to a young man behind a counter who would give us a voucher for free taxi service to our hotel. We did get a voucher for the taxi to the hotel, parting with a tip for the two young ladies who accompanied us to the taxi stand (not sure why we needed that!) and a tip for the taxi driver. 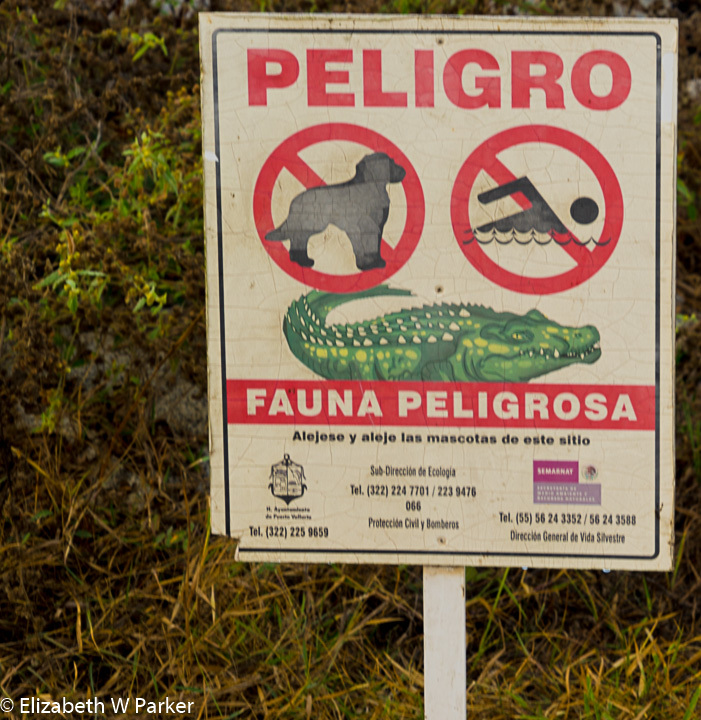 Unfortunately, it colored our initial impression of Puerto Vallarta in a negative way. Should you travel to Puerto Vallarta walk through the airport saying nothing and go directly to the taxi stand and get your own taxi. Our arrival at the hotel was slightly better. Again, a bit more servile hovering than I prefer, and slow service, but we finally got our room squared away and were able to repair there to unpack and rest and plan the afternoon. We are here in Puerto Vallarta to use our Melia timeshare points (remember the folly I mentioned earlier?) so our hotel is the Melia Puerto Vallarta and our room is a one-bedroom suite. The room is comfortable: bathroom, living room with dining area and kitchenette, bedroom next to the balcony, which has a jacuzzi. We are right above the play area, but though than a less than scenic view, there hasn’t been much noise from there so far. Our room is musty smelling, but immaculately clean. Around 3:30 we headed out to get something to eat. We left the hotel without any pesos, and so spent probably a hour walking around and asking for an ATM. Good thing we have a 10k step daily goal! Finally, provisioned with pesos, we returned to the marina area which is directly across the street from the Melia and had a delicious dinner at a restaurant called El Coleguita. 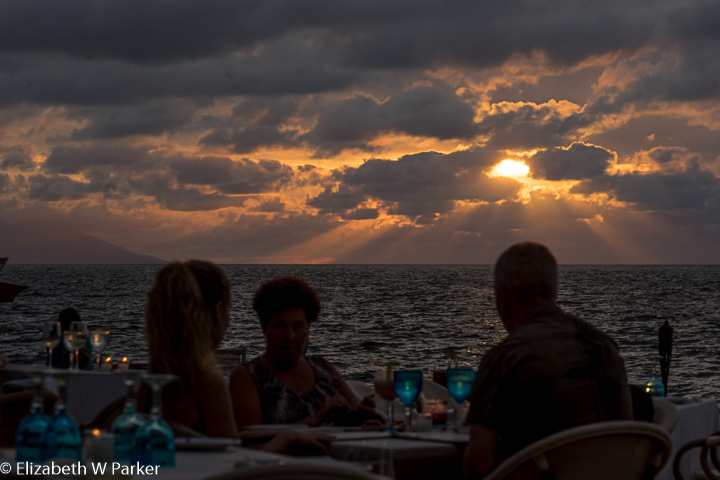 Fresh grilled fish and octopus, salad, guacamole and beer and margaritas…As a dinner/lunch, it was perfect! Done by about 6:30pm we retired for the evening … It had been a long day, getting up early for a flight that was an hour delayed, then lots of standing around and waiting for things to happen! Our day started a bit late – the sun doesn’t come up until after 7! I usually wake up about 5:30 am (no matter what time zone I am in, so 7 seems late to me). We started the day with coffee in our room (there is no start to a day without coffee for us). But afterwards we grabbed our cameras and went for a long walk as the sun slowly lit the sky. 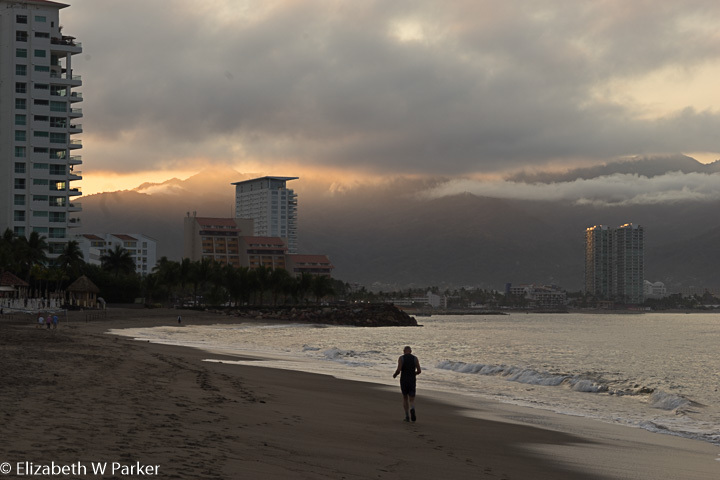 Here, we are on the west coast of Mexico looking towards China, so the sun rises behind the mountains, the Sierra Madre, and only gradually illuminates the beach. Looking southward, towards the city of Puerto Vallarta. (We are in Marina Vallarta.) There was fog between the buildings along the coast and the mountains behind them. As the sun rose, the fog took on a series of smoky hues – amber, taupe, grey – (I can just hear my husband … “can’t you just use normal color words? ?”) It was beautiful at any given moment, but it was also beautiful to watch how it changed. Once the sun had peaked out, we could clearly see the outline of the mountains. The tops of the buildings glowed as the light slowly crawled downward to eventually reveal the shapes of the city nestled in the foothills and strung along the shoreline. But all this was behind us as we walked northward along the beach, glancing back from time to time to see the spectacle. A contrast of nature versus human occupation could have been the theme of our walk. The beach sand was criss-crossed with the evidence of animal life. What looked like tiny four-wheeler tracks were probably the marks left by the many-footed crabs, large and small. Bird tracks, and those of mammals, whether pets or wild we could not discern, wound between shells, driftwood and sprigs of tiny pink coral. To our right were enormous condo/resort developments with lavish pools and landscaping. Very attractive to be sure, and with an unequaled view. The beach here is a string of semi-private areas with access from one to the adjacent. It isn’t apparent at first that you can walk the full-length of the beach, passing in front of successive condo and hotel developments – probably on purpose. 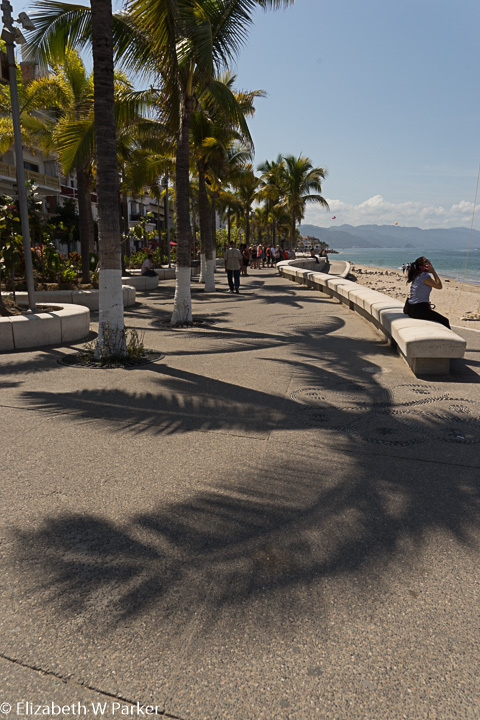 We are told that the best beaches of the area are south of Puerto Vallarta, but these were more than adequate. reminder of the devastation of Hurricane Maria that we left behind in Puerto Rico… plans interrupted, investments ruined. About 11:30 we took a cab to the northern end of the Malecón, and started walking toward the old part of the city where our previously schedule afternoon tour would start. 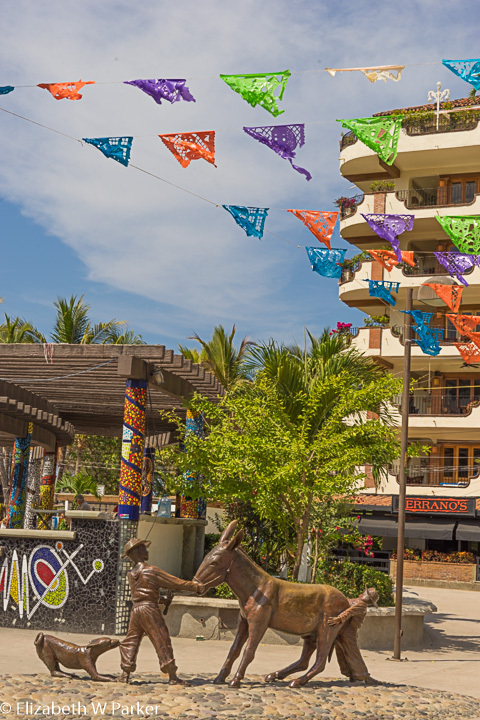 The Malecon at this end is quite pretty, with very colorful and thoughtful landscaping that hides all the shopping. You can walk on one side of the landscaping and enjoy the shops or walk, as we did, on the ocean side and enjoy the view of the water. The Malecón is dotted with bronze sculptures – all of them intriguing and interesting, creative and perplexing. I really loved the sculptures and will look them up. You can even take a walking tour that focuses on them. That might be a nice excuse for this walk! 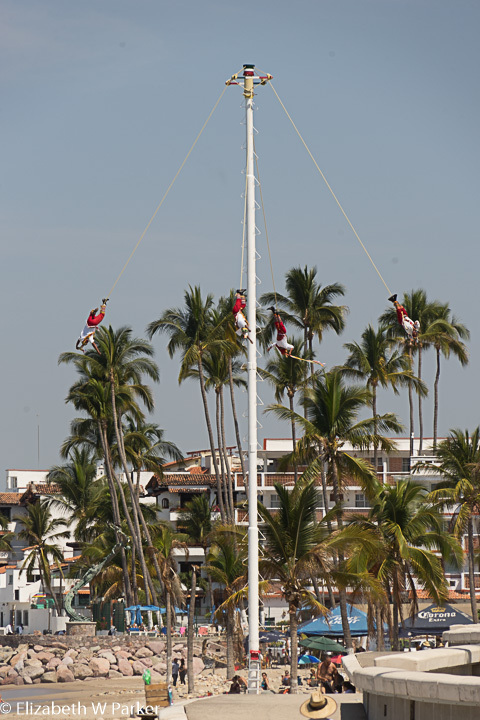 We also watched parts of a “voladores” spectacle – ours involved four flyers, versus the traditional five. 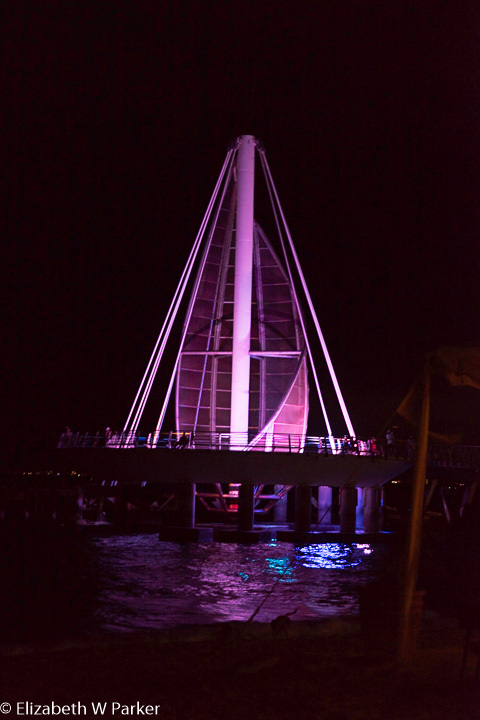 We watched them skinny up the pole, arrange themselves and their ropes, heard the music and then, though we missed the launch, watched them spin as they came down to the ground. 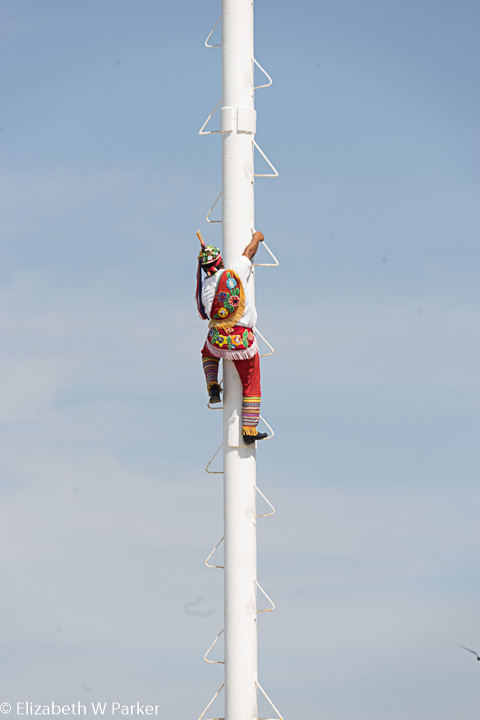 Initially, we had stopped to watch, but as it was a rather long preparation for the descent, we continued to walk down the Malecón, glancing backwards – that’s the reason we missed the launch. The Malecón widens near the Plaza de Armas, obviously a central point. It is here that you will find the Monumento el Caballito, pictured at the top of this page. The beautiful cupola of the cathedral is visible above the roofs of the nearby shops and restaurants. Tourist merchandise is prevalent here and hawkers are abundant. There is a series of arches in the wide plaza and a small amphitheater for public performances. We saw a procession of what appeared to be graduates in black robes and red tasseled mortar boards. Then the Malecón, narrows until it comes to the “middle” section (my name) just beyond the Rio Cuale bridge. Below the bridge on the north side is a crafts market. TripAdvisor and our guidebook both mention it, but on this walk we didn’t venture down to investigate. The character of this section of the boardwalk is different – a little less upscale, more local, more casual, more native. 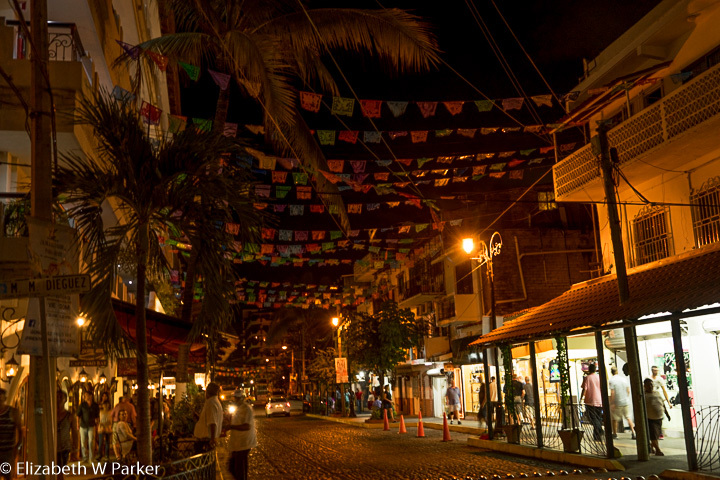 Narrow streets stretch back from the east side, revealing lively shopping, bars and eateries. 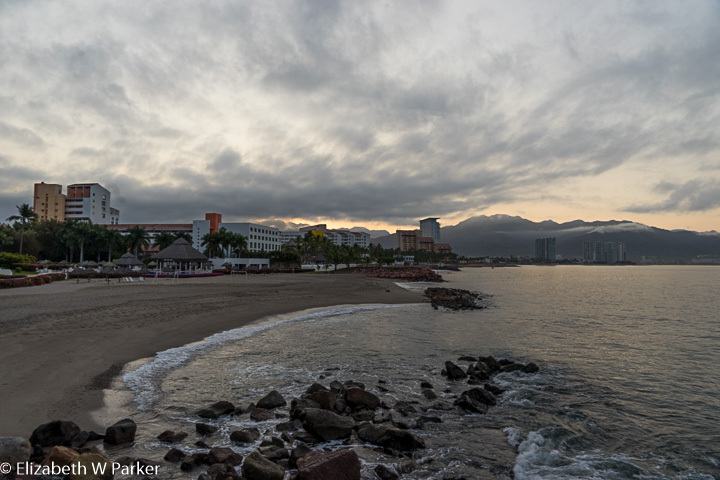 Along the malecón, these establishments spill out onto the beach – a lovely place to take in the sunset. This section is wide, too, and lined with restaurants and bars. The vibe is very lively and fun. 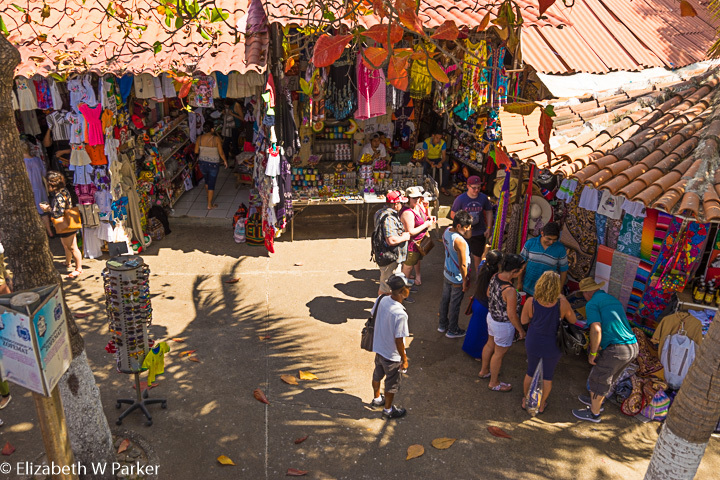 Our tour, called “Mex-ology” is one of several by Vallarta Food Tours. Billed as a way to sample the spirits of this part of Mexico, we also got to eat traditional snacks at each stop. There were 7 stops in all. Here is a list of our stops, what we sampled and how we liked each. Bar Zapata – Paloma (Mezcal and grapefruit soda with lime) and fried crickets. The crickets got very mixed reviews but everyone tried them, the Palomas were served in rustic clay cups. The group was very congenial, especially by drink #3, and we were best friends by #7! Our guide, Juri, did an excellent job, telling us stories as well as teaching us about the spirits and explaining life in Vallarta. Definitely, I would recommend this. It was great fun, good food, and wonderful introduction to the spirits. Our last stop left us on the beach at the Vista Grill. We ended up staying here for dinner – lured by the sight of whales breaching off-shore (far away but still easily discernible as whales). We were on the spirits tour with friends from Puerto Rico whose trip to Vallarta just happened to overlap ours. Our sunset dinner on the beach was a perfect end to the tour (though not part of it).